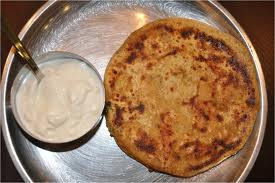 Prathu's Food: Aloo Paratha - Passionate Cooking for Vegeterian Food. Boil 2 medium potatoes with 2 cups of water. After the water comes to boil, reduce heat heat to medium. Let the potatoes cook until they are tender.Once tender, remove them from the water and let them cool down. Note: Do not cool the potatoes under running water because the potatoes will become too soft.After the potatoes are cold enough to handle, peel the skin off and mash the potatoes. Mix green chilies, cilantro, cumin seeds and salt to the mashed potatoes. Divide the dough and potato mixture into 6 equal parts. The potato balls should be about 1 1/2 times larger than the dough ballsroll the dough into 3 inch diameter circles. Place the potato balls in the centre. Seal by pulling the edges of the rolled dough together to make a ball Let it settle for 3-4 minutes before rolling itLightly press the ball on the sealed side and keep it on the topside when rolling. Roll the ball light handed in to 6-inch circles. Heat tava , place the parata over the tava. After a few seconds you will see the paratha change color and puff in different places. Then flip the paratha over. You should see some golden-brown spots on the topside. After a few seconds, spread 1 teaspoon of oil on the paratha. Again, flip the paratha apply oil, make sure that both sides turn golden brown.